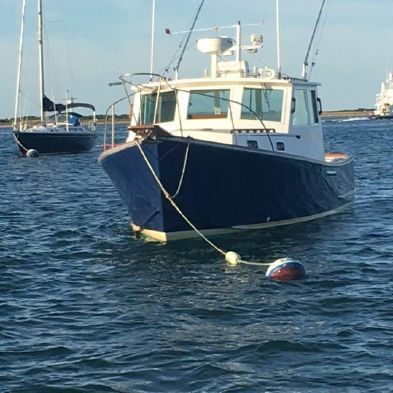 Not often seen on the market, a Wilbur Dirigo 31′ is being offered for sale. 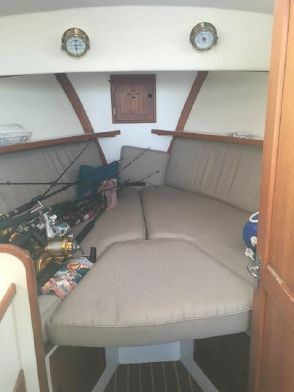 A kindly sea going 31′ for fishing or cruising. 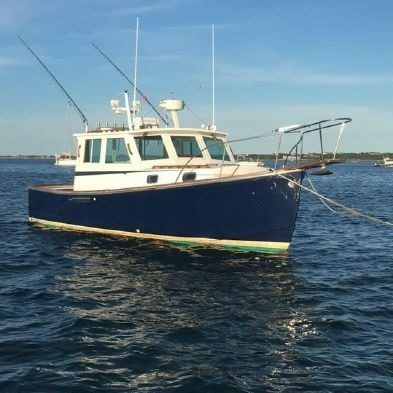 Vessel is being offered at $162,000. Starting forward is the characteristic Wilbur custom 3 foot teak bow pulpit with stainless steel bow rail. 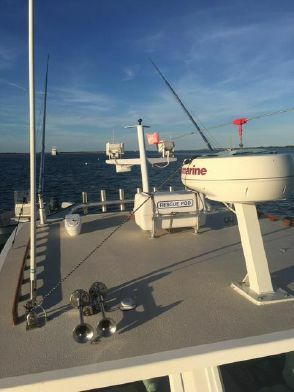 A helm controlled Lewmar windlass with stainless steel CQR plow anchor is at the ready with 20 feet of chain and 150 feet of 3/8 rode and optional 150 3/8 chain. 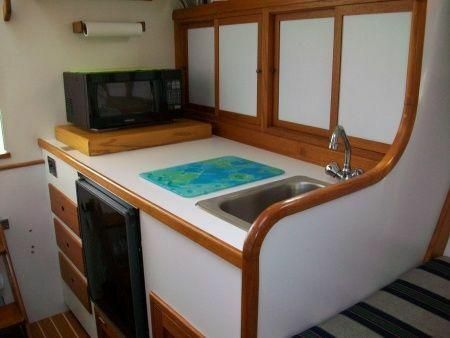 On the cabin top is a custom mast with 2-12 volt floodlights and 2- 500 watt floodlights and double trumpet horn. 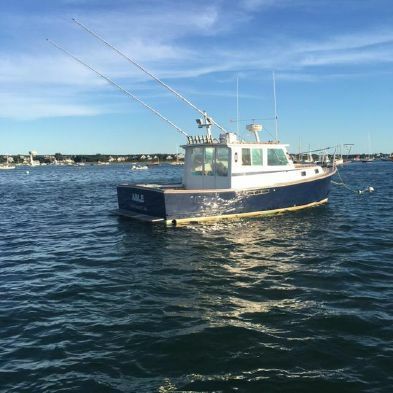 If occasional fishing are in your plans this Wilbur comes with Rupp Radial outriggers and an ample supply of custom rod holders. 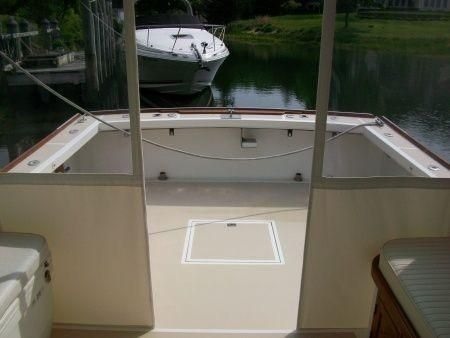 The above deck live well/tub is wash down pumped and is scupper overflowed. 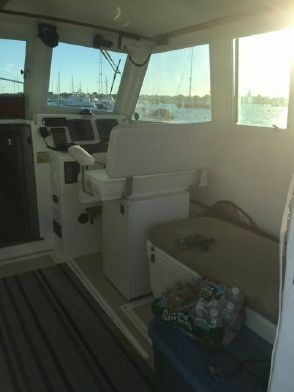 Passenger safety is provided with a 4-person Switlik life float with automatic release. The Emergency Position Indicator Beacon has a hydrostatic release for automatic deployment. 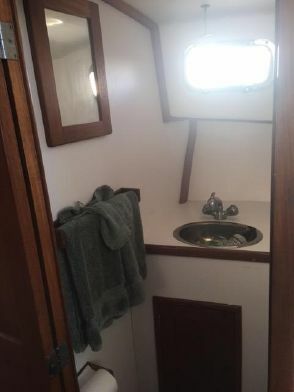 There are stainless steel dingy davits with all the rigging and a full teak swim platform. 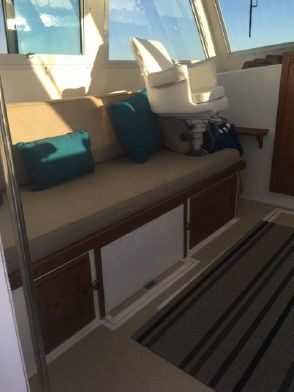 The bridge deck features the posted custom double helm chair and full backdrop canvas. 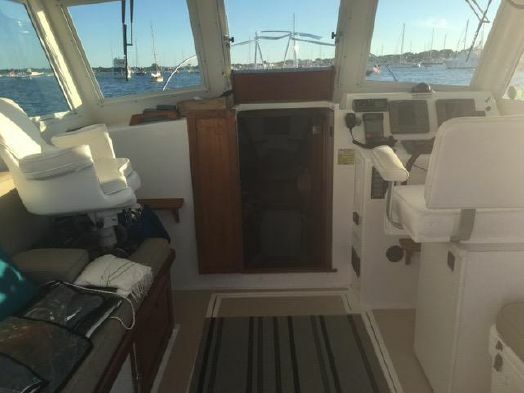 Navigational duties will be a breeze with Raymarine interfaced RL70C Plus radar, Raymarine L760 w/HSBW GPS and depth sounder, Raymarine ST6001 autopilot and ST600R remote control, Spectrum VHS radio and standard compass. For added entertainment, there is the AM/FM CD player. 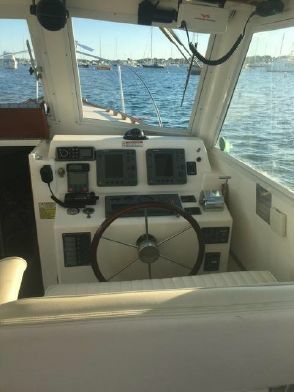 Steering is easy with a Hynautic hydraulic system. RACOR handles the fuel filtering for the 320 horsepower YANMAR 6LTA STP2 New 2017. This power plant is hooked up to a new transmission, new 2′ stainless shaft with a new dripless. Pumps, hoses and new gauges have been replaced in this re-power. Saltwater wash down is provided at two different locations and all wash down pumps replaced. For those cool mornings, you can flip on the bus heater with vents in the head and at the helm.